Biography of Photomontage Artist and Dadaist. please see: Art Photography Glossary. Along with Raoul Hausmann (1886-1971), Hannah Hoch (1889-1978), Heinrich Hoffmann (1885-1957) and Leni Riefenstahl (1902-2003), John Heartfield (born Helmut Herzfeld) was one of the greatest photographers in Berlin, during the interwar years. Active in the city's avant-garde art scene, he was one of the first artists to use fine art photography as a political weapon: his specialty being photomontage. (Note: The term Photomontage describes the method used to make a pictorial composition from cuttings of different photographs. A form of collage art, most of its exponents are involved in the entire process of shooting, developing and then staging the finished image.) Heartfield's pictorialism had a significant impact, although it was felt more in the arts than in politics. See also Nazi art (1933-45).  See also: the History of Photography (c.1800-1900).  For pioneers of lens-based art, see: 19th-Century Photographers.  For the aesthetics of photography, see: Is Photography Art? A founding member of the Berlin Dada Group, Heartfield (born Helmut Herzfeld) was a pioneer and principal exponent of the political photomontage in Germany around 1930. Son of socialist writer Franz Herzfeld (pen name Franz Held) and political activist Alice Stolzenburg, he spent his childhood in Switzerland and Austria. In 1905 he moved to Wiesbaden with his brother Wieland Herzfeld, where he trained to be a bookseller. From 1908 to 1911 he studied drawing, painting, graphic art and various types of design at the Royal Bavarian School for Arts and Crafts in Munich, where he was influenced by Albert Weisgerber and Ludwig Hohlweinafter. Then, from 1913 to 1914, after a period of work as a commercial artist, he attended classes at the School for Arts, Crafts and Trade, in Berlin-Charlottenburg. In Berlin he met Herwarth Walden (born Georg Lewin) (1879-1941) owner of Sturm magazine (1910-32) and the famous Sturm Gallery (1912-32), which became the most important centre of early avant garde art in Germany, specializing in German Expressionism, various styles of Post-Impressionism, as well as Cubism and Dada. Walden was a keen supporter of contemporary German artist groups like Die Brucke (1905-13) and Der Blaue Reiter (1911-14), with whose members Heartfield would have become familiar; he also befriended Franz Pfempfert (1879-1954), literary critic, portrait photographer and editor of Die Aktion), as well as the anti-war painter George Grosz (1893-1959), who later became a leading member of the expressionist group known as Die Neue Sachlichkeit. In 1916, Heartfield anglicised his name in protest against the nationalism of the Wilhelminian Kaiser. In 1917, he joined the Berlin section of the Dada movement, becoming one of its leading members - he was one of the organizers, for instance, of the First International Dada Fair, in Berlin in 1920. Also in 1917, together with his brother Wieland Herzfeld and George Grosz, he founded the publishing house Malik-Verlag and Xeue Jugend. In 1918 he joined the German Communist Party (KPD). However, in 1919, he was dismissed from the Reichswehr film service due to his support for the strike triggered by the murder of Karl Liebknecht and Rosa Luxemburg. In 1920, he and George Grosz founded a satirical magazine, called Die Pleite. During the 1920s, in addition to his Dada activities, Heartfield built theatre sets for a number of playwrights, including Bertolt Brecht, Erwin Piscator and Max Reinhardt. He also produced a wide variety of photomontages, many of which were reproduced as dust jackets for books such as "The Millennium" by Upton Sinclair. Indeed, photomontage (especially 'political' photomontages) soon became his specialty. He worked mainly for two publications: the daily Die Rote Fahne and, in particular, the weekly Arbeiter-Illustrierte-Zeitung (AIZ). In 1929, in collaboration with Kurt Tucholsky, he published the satirical picture book "Deutschland, Deutschland uber alles". In 1930, he produced his first photomontages for AIZ (he would eventually produce a total of 236). Heartfield remained in Berlin until the Nazi takeover in the Spring of 1933. On Good Friday, the Gestapo forced their way into his apartment, but Heartfield escaped by jumping over the balcony. He managed to leave Germany by walking over the Sudeten Mountains to Czechoslovakia. In 1938, he fled Prague for London. In 1950, he returned to Berlin, now in communist East Germany. Here he worked as a designer of posters and book-covers, although he was refused admission into the East German Academy of Fine Arts. Finally, in 1956, due to intervention by Bertoldt Brech, he was admitted to the Academy. After this, he produced a limited quantity of (ban-the-bomb) photomontages, as well as a number of theatre sets for directors like Benno Besson and Wolfgang Langhoff at Berliner Ensemble and Deutsches Theatre. In 1957, he received belated recognition for his efforts, when he was awarded his first retrospective. He died in April 1968 in East Berlin. 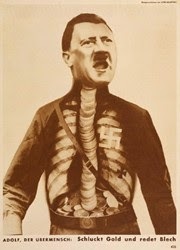 Photographs by John Heartfield have been exhibited in some of the best galleries of contemporary art in Europe and America. Here are some examples. Unless stated all shows are solo events. In addition to the camera artists mentioned above, here is a selected list of some of the best known pictorialist and fashion photographers of the 20th century.  For more about political photomontage, see: Homepage.  For other forms of camera art, see: Video Art.